Many people lately have written or spoken about what seems to be a growing “trust problem” in our society. In know – I’ve been one of those voices. 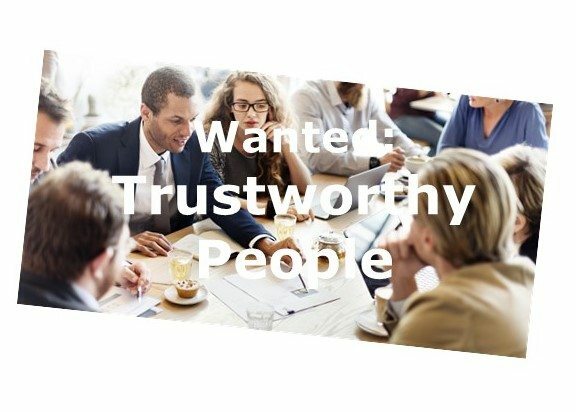 We point to surveys that show trust is at an all time low in businesses, political leaders and government institutions, media, and other areas of society. The punchline of these talks, articles and posts is usually that we just need more trust because trust is a good thing. But distrust is a natural and appropriate response to untrustworthy behavior. Who wants to trust people who act in bad faith? Rachael Botsman is right, what we lack is trustworthiness. What we need are more people, and particularly more leaders who are really worthy of the trust placed in them. There are two components required to be consistently trustworthy. The first is making a clear commitment to being worthy of others’ trust. The second is taking care to behave in accordance with that commitment day in and day out. The first is a moral choice; the second is an ongoing practice. The behavior of trustworthiness is something we can learn and get better at, but only if we are committed to doing so. One thing I’ve learned from personal experience as well as from the many leaders and managers I’ve coached over the years is that when we explicitly decide and declare a commitment to being trustworthy it makes the discipline of learning and choosing trustworthy behavior in our daily lives much easier. I’ve long contended that most people don’t knowingly act in bad faith. Instead they damage trust with each other by failing to pay attention to their words and actions. Based on this belief, most of the work I’ve done with clients to support stronger trust in organizations has been focused on helping people recognize and practice behaviors that build trust while avoiding those that damage it. Lately, however, I am concerned an increasing number of leaders in business, politics, media and other sectors of our society have stopped bothering with a moral compass to navigate their lives. These people don’t seem to care much about being worthy of others’ trust except when it serves them in the moment. They feign trustworthy behavior to get something they want—power, wealth, status—or to avoid some unpleasant consequence. Instead of building trust for the long haul it is merely transactional and easily abandoned when no longer needed. They often actively choose to act in bad faith. We are seeing the upshot of this in the results of research showing precipitously declining trust in the institutions that form the cornerstones of a civil, democratic society: our political and civic organizations, the businesses that form our economy, the media who inform our understanding of what’s going on in the world, our schools, and even in some cases our churches. One of the fundamental concerns we have when it comes to trusting someone is: Can I believe you intend to be trustworthy, even if you don’t always hit the mark with your behavior? It is a concern about care, sincerity, and moral grounding. We can forgive each other for breaches of trust, which allows us to live and work together effectively going forward, but only when we believe in each others’ moral commitment to being trustworthy. Don’t just take my word for it, try it out for yourself. Declare out loud to yourself that you are committed to being worthy of others’ trust. Better yet make that commitment to your friends, to your boss, colleagues and the people who work for you; to your customers. Notice what happens to you when you do. And notice how it affects the people you make that commitment to. You may want to warn people you won’t always live up to your commitment, that sometimes you’ll mess up. Because if you’re like the rest of us you will. But tell them you want to hear about it right away so you can restore trust, learn and adopt new behavior that is trustworthy. After you’ve done it yourself a few times try asking others to commit to being worthy of your trust. Ask your employees, your boss, the people on your team, your city council representative. Ask your kids. Listen and watch how they respond. Is his body aligned with his words? Does she sound like she really does intend to be worthy of your trust? If so, extend them your trust (or continue to do so). If you have doubts, heed that inner voice and do what you need to take care of yourself. I don’t expect this will bring a sudden end to our society’s trust problem, even if everyone who reads this article does it and then passes it on to three more people who do it. What it can do is create a subtle but powerful shift in you and your relationships. Then, over time, as more people do the work required to be truly worthy of others’ trust we will hopefully see a larger social shift, a reversing of the dangerous trend of the past few decades.